We no longer update this website. This entry was posted in Uncategorized on January 21, 2018 by lukeakehurst. Your CLP can now nominate candidates for the National Constitutional Committee (NCC) and Conference Arrangements Committee (CAC). These are incredibly important internal elections taking place later this year. The NCC deals with disciplinary matters within the party – a role which, unfortunately, has become increasingly important in recent years. The CAC deals with matters related to Labour Party Conference, including setting the agenda. This entry was posted in Uncategorized on January 19, 2017 by lukeakehurst. The National Executive Committee (NEC) elections have started. Ballot papers should have reached you by email already and by post by next Friday. They have to be returned by 5 August. Only full Labour Party members who joined before 24 June this year will receive a ballot. It is essential you remind all mainstream Labour members you are in contact with to vote, and let them know who our recommended candidates are. Control of the NEC is finely balanced and we need mainstream candidates elected to ensure the Hard Left do not use the NEC to advance their factional interests within the party. Here is a link to a model “Get Out the Vote” letter: https://gallery.mailchimp.com/271f6fffa61efcfd965911e04/files/NEC_GOTV_Letter.docx. We want you to post or email this in your own name to anyone you know in the party to encourage them to vote in the election. If you are a councillor or MP etc. with legitimate access to the membership list for the area you represent you are entitled to send an email of this nature to the whole membership list. Similarly CLPs that nominated our candidates can send a recommendation on which way to vote to their whole membership. Individual members of the Labour Party who joined on or before 12 January this year. They remain a member of the trade union or socialist society (and pay the political levy where appropriate). They remain on the electoral register at the address provided. In all other respects must meet the qualification criteria of membership of the Labour Party. New affiliate supporters may be recruited from membership of affiliated organisations and socialist societies (as at freeze date) by 8th August 2016. The NEC has agreed that the one-off payment for Registered Supporters in this contest will be £25 not the £3 it was last year. Registered supporters from last year will need to reregister and pay the £25. Applications to be a Registered Supporter will open at 5pm on Monday 18 July and close at 5pm on Wednesday 20 July. People who joined the party or their trade union too late for the freeze date can still vote by becoming a Registered Supporter and paying the £25. We will send round the link for people to sign up as Registered Supporters as soon as it goes live. Tuesday 12 January: Join the Labour Party on or before this date to vote in the leadership election. Tuesday 12 July: Timetable agreed. Freeze date for membership eligibility. Monday 18 July: European Parliamentary Labour Party (EPLP) and Parliamentary Labour Party (PLP) briefing, followed by PLP hustings. Registered supporters applications open. Monday 18 July 7pm: EPLP and PLP nominations open. Wednesday 20 July 5pm: EPLP and PLP nominations close and supporting nominations open. Registered supporters applications close. Thursday 21 July noon: Deadline for validly nominated candidates to consent to nomination. Friday 22 July: Hustings period opens. Monday 8 August noon: Final date for membership arrears to be paid in full. Final date for updated affiliated supporter lists to be received. Monday 15 August noon: Supporting nominations close. Week commencing Monday 22 August: Ballot mailing despatched. Wednesday 14 September noon: Last date for electronic ballot reissues. Friday 16 September: Hustings period closes. Wednesday 21 September noon: Ballot closes. Saturday 24 September: Special conference to announce result (to be scheduled to ensure no clash with Women’s Conference). This entry was posted in Uncategorized on July 16, 2016 by lukeakehurst. If Jeremy Corbyn is the answer then many baffled New Labourites still wonder what the question is. However, many on the Left assume the last Labour government delivered little for working people. For them Corbyn may be the answer, with ‘a real alternative to the Tories’? But the assumption is wrong and Corbyn isn’t the answer. Labour delivered huge gains, which nail the lie that it was ‘Tory Lite’. The crash of 2008 changed everything. It was caused by reckless bankers but Labour took the blame because we failed to defend our record from relentless Tory attacks. Prior to the crash, Labour delivered sustained economic growth and low inflation and mortgage rates. We won elections on the ‘Labour Investment vs Tory Cuts’ argument so, in 2007, the Tories pledged to stick to Labour’s spending plans. Tony Blair was the first prime minister, of any party, to send his children to state schools so his commitment to ‘Education, Education, Education’ was genuine. Labour raised standards enormously and produced record numbers of school leavers with 5+ GCSE passes, helped by the recruitment of 36,000 more teachers and 274,000 more teaching assistants. George Osborne said ‘Labour failed to repair the roof when the sun was shining’. We rebuilt or refurbished around 3,700 schools, and repaired every leaky roof neglected during the Tory years. Labour’s before & after school clubs and free pre-school places were a ‘win-win’ because children got more education and parents had more scope to work, especially lone parents. Under the Tories, patients festered for months/years waiting for operations. Labour reduced NHS waiting times to average of 18 weeks (the shortest ever) and took over half a million people off of the waiting lists, helped by the recruitment of 85,000 more nurses and 32,000 more doctors. We built (or started building) over 80 new hospitals and renovated every A & E department. More roofs repaired while the sun was shining. Labour delivered huge gains for working people. The lowest paid saw their incomes greatly increased by the Minimum Wage (Kier Hardie’s legacy) and Tax Credits. We made it law for full time workers to have 20 days paid holiday (plus Bank Holidays), and for part-time workers to have equal pay rates, pension rights, holidays and sick pay. Labour improved maternity leave and introduced paternity leave for fathers. Children and pensioners benefited greatly under Labour. We lifted 600,000 children out of poverty and built 2,200 Sure Start Centres in the most deprived areas. We lifted a million pensioners out of poverty by targeting assistance to those in most need instead of, as critics suggested, simply spreading limited resources evenly across all pensioners. Labour devolved more power than any previous government. We created a Scottish Parliament (John Smith’s legacy), a Welsh Assembly and reintroduced London wide government. Labour ended decades of bloodshed in Northern Ireland by delivering the Good Friday Agreement in 1998 and the St Andrews Agreement in 2006. Remember that picture of Ian Paisley and Martin McGuiness around the same table? Hundreds of lives were saved as a result of sworn enemies running Northern Ireland together in peace. The Tories assumed they had a permanent majority in the House of Lords but Labour corrected this undemocratic outrage by removing 600 hereditary peers. We can now defeat the Tories in the Lords, and we did over recent Tax Credit cuts. An internationalist Labour government reduced world poverty by doubling the overseas aid budget and canceling 100% of the debt of the world’s poorest countries. This helped to lift 3 million people out of poverty (each year) and provide education for 40 million children. It’s time to set the record straight on the last Labour government’s proud record. It wasn’t ‘Tory Lite’. Most achievements were opposed by the Tories, who claimed the investment in public services was ‘wasteful’, the Minimum Wage would ‘cost a million jobs’ and improved rights at work was ‘red tape’. But it’s not easy to elect a Labour government. Since Universal Suffrage in 1918 only five general elections (out of 26) have delivered a Labour government with a sustainable working majority. Three of those elections produced the last Labour government. In the last century, the Tories governed Britain for more years then the Communist Party ran the USSR. Our Labour government gave us the longest period of non-Tory rule in over 200 years, but many of its other achievements may have been overlooked by even the most seasoned Labour watchers. Many Corbyn supporters probably don’t know these achievements existed. We should be proud of a Labour government that did so much to help working people. If we don’t want the last Labour government to become the last Labour government we need to remember its achievements, because how can we expect voters to elect another Labour government if Labour members and supporters aren’t prepared to defend the record of the last one? This entry was posted in Uncategorized on March 9, 2016 by lukeakehurst. Like many Labour Council Leaders and Leaders of Labour Groups I was heartened and encouraged to receive a letter dated 17th December from Party Leader Jeremy Corbyn, Shadow Chancellor John McDonnell and Shadow Secretary of State for Communities and Local Government Jon Trickett, setting out the leadership’s position in relation to the setting of legal council budgets. I say heartened and encouraged because there had been some noises off in lead up to this about the setting of “no cuts” budgets and the usual ultra-leftist nonsense about Labour Councils doing the Tories dirty work etc. Let me quote directly from the letter. “The Shadow Chancellor John McDonnell MP, said in September, “…the situations councils are now in is if they don’t set a budget, a council officer will do it for them. There is no choice for them anymore.” As you know, councils must set a balanced budget under the Local Government Act 1992. If this does not happen, i.e. if a council fails to set a legal budget, then the council’s Section 151 Officer is required to issue the council with a notice under Section 114 of the 1988 Local Government Act. Councillors are then required to take all the necessary actions in order to bring the budget back into balance. So far so good and fairly unequivocal you would think. Not so. According to a statement from the Labour Representation Committee, to see this as an endorsement of responsible and legal budget setting is to engage in “hasty and highly selective reading” of the leadership’s letter. The letter does go on to talk quite rightly about the government’s austerity cuts being a political choice rather than an economic necessity and of the importance in the run up to local government and mayoral elections in 2016 of pinning the blame for cuts in local government services squarely on the Conservative Government which is causing them. No problem there, although I do wonder what they think we have been doing since 2010! None of us came into local government to cut peoples services and I for one and am more than happy to campaign with the party nationally and locally to expose the devastating impact of this government’s cuts to local council spending. Another suggestion recently mooted has been for councils to dip into their reserves to fill spending gaps left by central government cuts. Again what do people think councils have been doing up until now? Interestingly the late unlamented former Secretary of State for Communities and Local Government, Eric Pickles used to use this argument when challenged by the LGA and others about cuts to council funding. “What are you moaning about”? Eric would say. “You’re sitting on mountains of reserves”. Strange bed fellows indeed. I have to say that what reserves my council holds in no way resembles a mountain, more like a small grassy mound. The most recent local government settlement is, if possible, even more challenging for Labour Councils in the years ahead. We have done some great things in town halls across the land in recent years and shown what Labour can achieve when in power. However, we need to remain united within our Labour Groups. Discipline and cohesion is important. Without that we will be easily picked off. Siren voices urging “no cuts” illegal budgets will not help us in holding this rotten Tory Government to account. We’ve been down that road before and it is a dead end. Nominations are now open for the six CLP representatives on the National Executive Committee. The 33 member NEC is currently finely balanced between the Hard Left and mainstream members. The NEC is the governing body of the party between Annual Conferences in all matters relating to party organisation and rules. 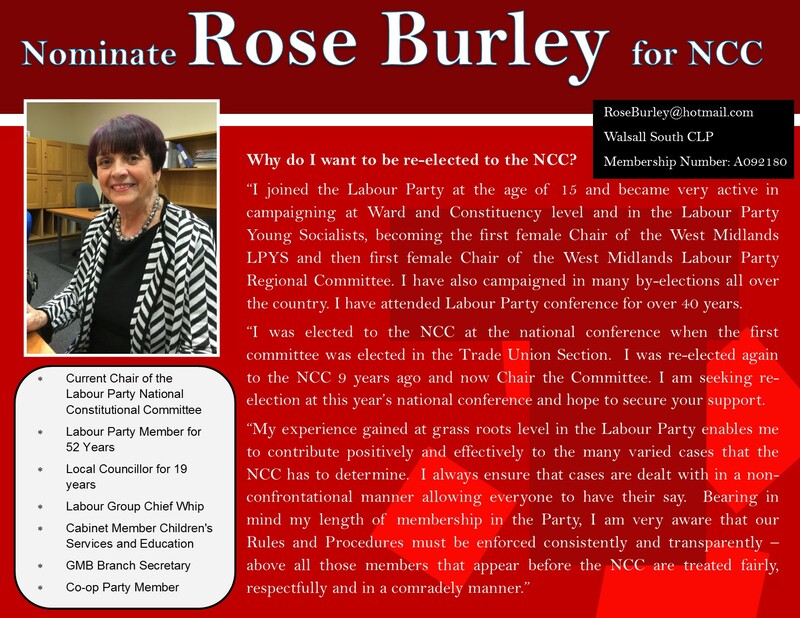 Bex Bailey.As an NEC member for the past three years Bex hasn’t stopped campaigning for Labour and for members. She has prioritised supporting young members across the country to campaign for Labour, getting more young women involved, and introducing a comprehensive sexual harassment policy. She has consistently championed diversity in our party and is determined to ensure cost is not a barrier to working class people standing to be candidates. Ellie Reeves. Ellie has been on the NEC for almost 10 years and is currently vice chair. 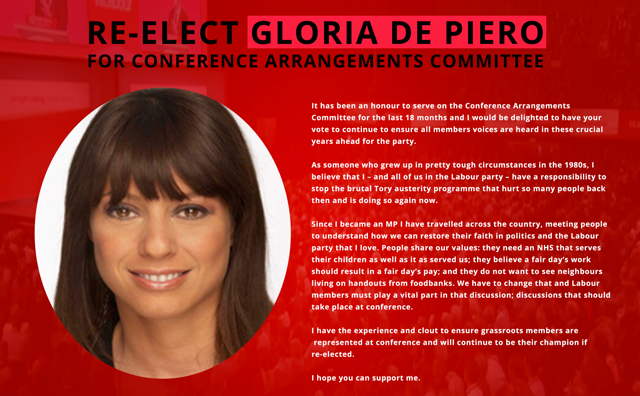 She is elected with broad support from across the party. Ellie is a trade union lawyer and is passionate about workers’ rights. She has the experience, commitment and credibility to get the right policy platform and campaign strategy in place and to hold the leadership to account. Peter Wheeler. Peter served on the NEC until 2010 and from 2012-2014. He is from Salford where he is a local councillor. 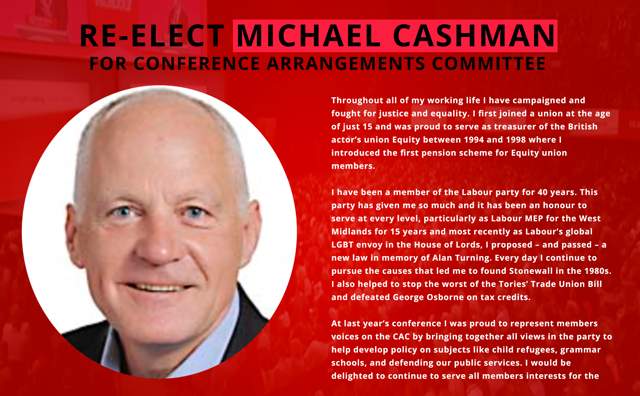 A former full-time official for the Labour Party and Amicus trade union, he is committed to building a strong democratic and campaigning Labour Party. 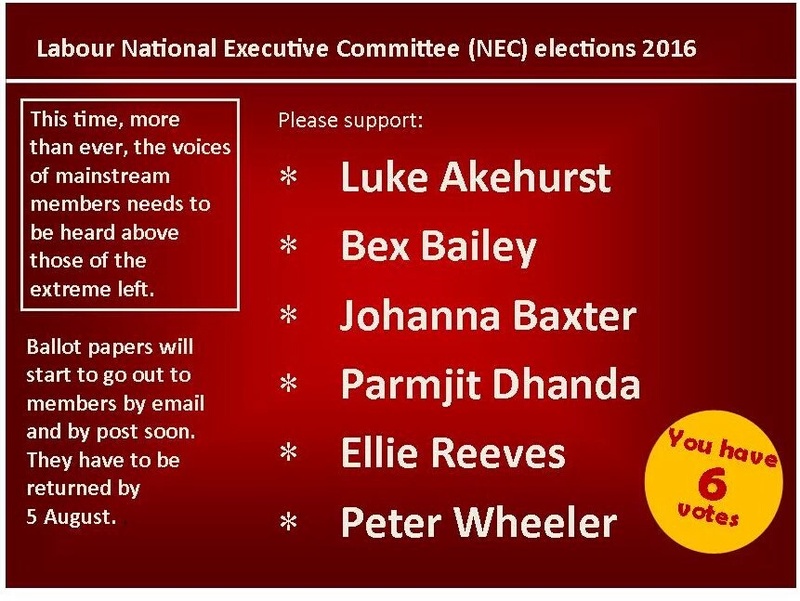 Each CLP can nominate up to six NEC candidates. CLPs can nominate at any time between now and 24 June. Many CLPs do this before the start of the local election campaign in April. Please email labourfirst@gmail.com to let us know when the date is of the All Member Meeting or delegate-based General Meeting when your CLP will nominate. Please work with other mainstream local members in your CLP to ensure you nominate as many as possible of our recommended candidates. As soon as your CLP has nominated, please let us know the result. 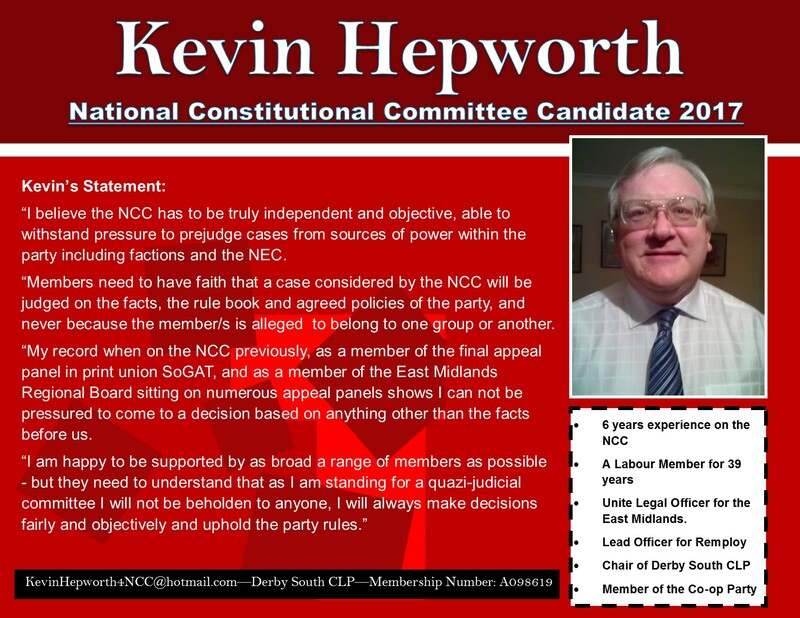 Each CLP can also nominate for one seat on the National Constitutional Committee, which handles the most difficult disciplinary cases and disputes. We are recommending support for Maggie Cosin who is a long-standing incumbent NCC member, currently Chief Whip on Dover Council and formerly Deputy Leader of Camden Council. The NEC CLP reps are elected by OMOV of full members in July/August whilst the NCC CLP rep is elected by CLP delegates at Annual Conference. This entry was posted in Uncategorized on January 29, 2016 by lukeakehurst. Taking the fight to the Tories – by showing we can beat them. Now I don’t know how many of you read the remarks by Dave Watts in the House of Lords this week. Dave was MP for St Helens for 18 years. The elected chair of the Parliamentary Labour Party. Before that, he spent years as a local councillor and was leader of the council. An apprentice engineer and former union shop steward, ‘straight talking, honest politics’ is definitely where Dave is at. “My advice to my own party leadership is that they should take less notice of the London-centric, hard-left political class who sit around in their £1million mansions, eating their croissants at breakfast and seeking to lay the foundations for a socialist revolution”. It’s good to see that Labour First is officially a ‘croissant free zone’. Unlike no doubt at today’s Fabians society conference in London today, there is not a croissant a brioche or a pain au chocolat in sight. Today I want to talk about how we take the fight to the Tories by showing we can beat them. And the starting point for that is that we must begin focusing on the Tories, not on ourselves. NHS waiting lists have risen by almost one million under David Cameron, it’s harder to see your GP – one in four have to wait more than a week or they can’t get an appointment – and thousands of cancer patients are waiting too long to start their treatment. The number of patients waiting longer than 4 hours in hospital A&E departments is up 34 per cent year-on-year. The Tories forced through a damaging top-down reorganisation which diverted £3bn from patient care. We have junior doctors – not exactly a hotbed of industrial militancy – feeling that things have got so bad, they have to go on strike. 89,000 more nurses and 44,000 more doctors. Waiting lists had fallen by over half a million and waiting times were at their lowest level since records began. We saw the largest ever hospital building programme in history, with 118 new hospitals opened – a further 18 under construction. Remember how the Tories said they’d balance the books by 2015? Well the deficit this year is still set to be £73.5 billion. They trebled university tuition fees. As a result the typical student will leave university with more than £44,000 in debt – £20,000 more than under the previous system. They broke their promise on VAT and put it up to 20 per cent – a move that costs a family with children £450 a year. The last Labour Government introduced the 50p rate of tax for those with income over £150,000 to ensure that the better off paid their fair share in reducing the deficit. But at the same time as making ordinary families pay more, the Tories cut the top rate of tax for the richest one per cent of taxpayers. That means someone earning £1 million a year got a tax cut of more than £40,000 a year. At the same time, the number of children living in absolute poverty has risen by half a million (between 2009-10 and 2013-14). Under the last Labour Government this number fell by 1.9 million. Under the last Labour Government 3,500 new Sure Start centres were opened – one for every community. Under this Government, the number of designated children’s centres has fallen by more than 760 since 2010. Under the Tories there are 17,000 fewer police officers – despite David Cameron promising to protect the frontline – with neighbourhood policing becoming a thing of the past. The last Labour Government delivered more than 16,000 police officers and 16,000 Police Community Support Officers. Labour introduced Working Tax Credit and Child Tax Credit in 2003 to help low income working households. But, despite the u-turn we forced from them last year, the Tories are still cutting back this support. According to the independent Institute for Fiscal Studies, Tory cuts to Universal Credit mean 2.6 million working families will be £1,600 a year worse off on average. The last Labour Government brought 1.5 million council houses up to a decent standard, with over 700,000 new kitchens, 525,000 new bathrooms and over a million new central heating systems fitted. And we embarked on the biggest program of council house building for twenty years. Should we have done more in the early years? Absolutely. But today with have a crisis in housing. House building is at the lowest level in peacetime since the 1920s. Home ownership is down by more than 200,000. Rents are up. And of course it’s our people that suffer the most. Under this Government, we have seen the ten most deprived local authority areas lose £782 per households because of the cuts. In contrast, the ten wealthiest areas have lost just £48 per household. So of course we should be getting after these Tories – it’s what John Spellar calls “a target rich environment”. Absolutely we should be taking the fight to the Tories and not picking another fight with ourselves. (Which is why) the decision to open up a divisive debate within the party about the renewal of trident is such an unnecessary distraction. After weeks of damaging speculation about the reshuffle that drowned out our attacks on the Tories, it then took the leadership 11 days to complete a fairly modest reshuffle of the frontbench team. How many days are we planning to waste having a self-indulgent debate about Trident? Labour party policy is very, very clear: we are in favour multi-lateral disarmament and the renewal of Trident. Only a few months ago, the Labour Party Conference – still the sovereign policy making body in the Party – considered the issue again. Not only did Conference overwhelmingly decide against having another divisive debate – let’s remember that the call for a debate on Trident was supported by just 0.16% of the trade union vote and only 7.1% of the CLP vote. But there was also a vote to endorse a strategy of multilateral disarmament and the renewal of Trident when Conference took the decision to support the Britain in the World policy report from the National Policy Forum. This came out of the National Policy Forum which we know is a lengthy and considered process that rightly fully involves the trade unions, the socialist societies, regional CLP reps, young people in the party, together with NEC members and shadow ministers. We make policy in the Party through our democratic structures – not by diktats from the centre. We are a movement and when it comes to making policy we want to involve everyone in that movement. We don’t make policy simply on the basis of a weekend email sent to a selection of party members where we might just have an up to date email address. We must not shortcut the Party’s democratic structures – to do so is to perform a grave disservice to our members. I also say this to Jeremy and the party leadership: if you really want to change our policies, pick the issues that matter to people outside the meeting halls, not just to those inside. Pick the issues where we can unite and where we can get back in touch with the public – let’s not split the Party and drive yet another wedge between the Party and the country. But what are we told instead about Trident? We are told by Ken Livingstone – who still remains the co-convenor of the Labour policy commission by the way – don’t believe for a single second that he’s not involved, despite the deal he’s apparently done with Emily and Jeremy in a pub in Islington. We’re told by Livingstone that he can cobble together a new defence policy in the next eight to ten weeks in the review. Now I was involved as a shadow defence minister in a policy review the Party did back in 2010-2011 on defence procurement. One of the people leading that review was Lord West, the highly decorated former First Sea Lord and Chief of the Naval Staff. Alan West brought decades of experience in defence, he was a former Labour Minister for Security in the last Labour Government, and he is a full Admiral, no less, the equivalent of a four star general. Now I’m sure Ken Livingstone likes to think that he’s got a chest full of campaign medals. But we’ve gone from having our defence reviews led by people with four stars – to now where they’re being run by people with the Morning Star. And there are real dangers here for Labour. For nearly three decades Labour has been committed to multilateral disarmament. We tried unilateralism before. It ended in electoral disaster then. There is no evidence to suggest that it won’t end in disaster again. And running online plebiscites of a selection of party activists won’t change these facts of political life. (But the truth) is we cannot afford to open this up again. This May Labour faces incredibly important elections. The idea that we can afford to spend a single day from now to May talking to ourselves about a divisive issue like Trident, rather than talking to the country about what this Tory Government is doing, is frankly barmy. The elections in May are a huge test for all of us in the Party but they will also provide the biggest indication yet as to whether Labour is heading in the right direction. We will be able to answer that big question: after last year’s devastating defeat in the general election, are we getting back in touch with the country or are we moving even further away from the public? We face a major electoral test in every corner of the country. that we can come to the aid of those most in need, whilst at the same time having policies to that appeal to those in the middle too. But whilst London will undoubtedly be the focus, perhaps even the obsession, of the London-based media and even some in the Party, the forthcoming May elections are a much bigger test than that. We must win in London, but it won’t be good enough just to win in London. Labour has to hold onto power in Wales and hold the Welsh Government. We will also see if Jeremy is right in his conviction that his left wing appeal is the key to turning things around in Scotland. And we have to demonstrate that we are capable under Jeremy’s leadership of winning new support and hundreds of new council seats in England. Any Party that really is on its way back to power nationally does so on the back of winning in local government. Look. The best way to fight the Tories is to beat them. There is that phrase: don’t get angry, get even. In Labour, I sometimes think there are those who are content just to get angry. Well I want us to get angry and get even. I want Labour to become a party again that the Tories genuinely fear. The biggest gift that we can give to the Tories is to deliver a Labour Party that is uncompetitive. We’ve got to show that we can start winning again. We must pick fights with the Tories, not ourselves. We must focus on the country, not in on ourselves. That is how you unite the Party. Because who pays the price when Labour loses and the Tories are allowed to win? It’s our people. It’s the people we came into politics to serve. Every time you see something bad that the Tories are doing, blame the Tories, expose what they’re doing hold them to account. But also say to yourself: that is happening because we lost the election. Every day spent not making Labour more electable is a wasted day and ultimately it is a betrayal of the people we came into politics to serve. We’re here in the heart of the Midlands. The heart of where elections are fought and won or lost. Remember how you felt last May when that result from Nuneaton came in. And we realised the game was up. Remember how bad you felt when it was clear that the Conservatives had won a majority in Parliament. But remember what it was like to win. In 1997, in 2001, again in 2005. There are people in this room who played a part in those great Labour election victories before then too. But imagine the look on the faces of George Osborne, Boris Johnson and Theresa May if we could beat them in 2020? I started with a quote from Dave Watts. Let me end with one too. This one isn’t about croissants. “It is not the job of the parliamentary Labour party to sit around developing ultra-left-wing policies that make it feel good. It is its job and responsibility to come forward with policies that will help us to win the next general election”. It’s our job – the people in this room – our MPs, councillors, trade unionists, the party activists – to fight for a Labour Party that can beat the Tories and win for the country once again.